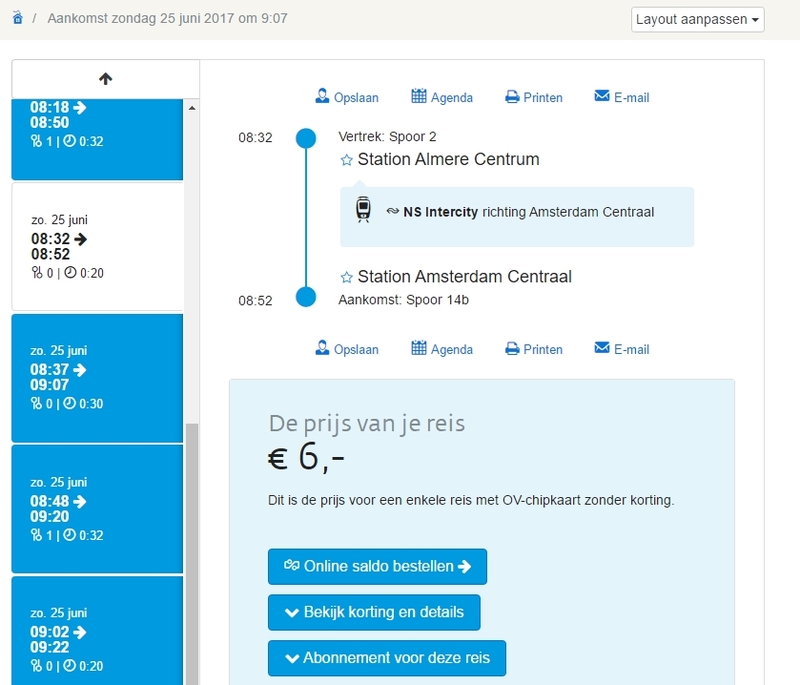 There are two types of trains you will see listed on Netherlands train monitors for travel within Netherlands; Sprinter trains & Intercity trains. Most trains do not run between 1am and 6am. During those times there are night buses. Sprinter Trains (SPR) – Contrary to their name, Sprinter Trains stop at most, if not every stop. They used to be called Haltetrein (Stop train), but that sounded too slow, so the name was changed to Sprinter. Sprinter trains can be abbreviated as SPR on train boards. Intercity Trains (IC) – Intercity trains are the express trains. They typically stop at a large city’s centeral station or the airports. They are abbreviated as IC on train monitors. 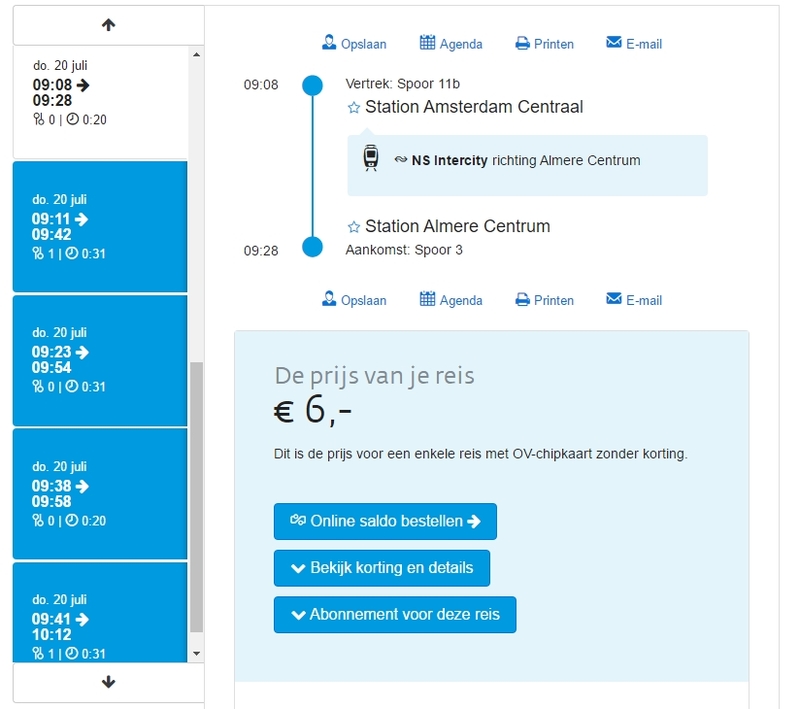 There is no price difference between the trains so taking a sprinter from Amsterdam Centraal to Almere Centrum costs the same as taking the Intercity train. However, the Intercity train is 10 minutes faster. 1st Class – Semi private enclosed seating areas containing about 25-30 seats. The seats don’t appear to be significantly better than 2nd class, but you are kept away from the peons by a cheap swinging door. Naturally this “comfort” comes at an additional price. 2nd class – This is a normal seat. Almost everyone rides 2nd class because its cheaper and you get there at the same time as 1st class people. The seats are spacious and fairly comfortable. Bikes also go in 2nd class. All prices seen below are for 2nd class tickets. This is a weekday schedule. There are 3 trains from Amsterdam Centraal to Almere Centrum every 30 minutes. The Intercity train leaving at 9:08 and 9:38 is the fastest option at 20 minutes. It has no stops and no train changes. The Sprinter leaving at 9:11 and 9:41 involves one train change and takes 31 minutes. The sprinter leaving at 9:23 and 9:53 has no train changes and also takes 31 minutes. Intercity trains leave at 8 and 38 minutes past the hour. While sprinter trains leave at 11, 23, 41, & 53 minutes past the hour. 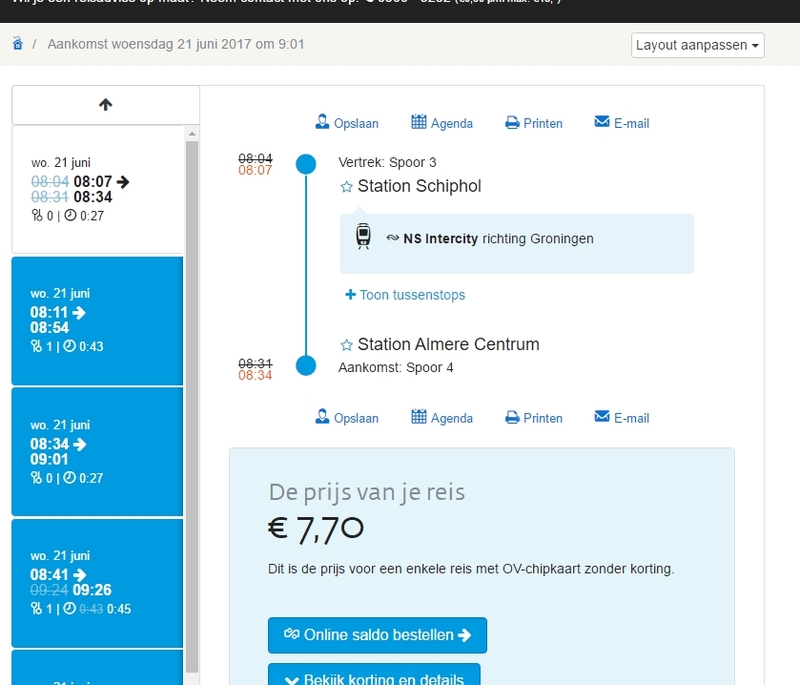 Train stops between Amsterdam & Almere are shown in the graphic below. If you need to go to someplace in Amsterdam or Almere other than the central stations, you can use trams, buses or sprinter trains to go to the smaller stations. This is a weekday schedule. There are 4 trains from Schiphol Airport to Almere Centrum every hour. The Intercity train leaving at 8:04 and 8:34 is the fastest option at 27 minutes. It has no stops and no train changes. The Sprinter leaving at 8:11 and 8:41 involves one train change and takes 43 minutes. Intercity trains leave at 4 and 34 minutes past the hour. While sprinter trains leave at 11 and 41 minutes past the hour. This is a weekday schedule. There are 3 trains from Almere Centrum to Amsterdam Centraal every 30 minutes. The Intercity train leaving at 8:32 and 9:02 is the fastest option at 20 minutes. It has no stops and no train changes. The Sprinter leaving at 8:18 and 8:48 involves one train change and takes 31 minutes. The sprinter leaving at 8:07 and 8:37 has no train changes and also takes 31 minutes. Intercity trains leave at 2 and 32 minutes past the hour. While sprinter trains leave at 7, 18, 37, & 48 minutes past the hour. This is a weekday schedule. There are 4 trains from Almere Centrum to Schiphol Airport every hour. The Intercity train leaving at 8:29 and 8:59 is the fastest option at 27 minutes. It has no stops and no train changes. The Sprinter leaving at 8:06 and 8:36 involves one train change and takes 43 minutes. Intercity trains leave at 29 and 59 minutes past the hour. While sprinter trains leave at 6 and 36 minutes past the hour. Weekend & Holiday schedules will differ from the weekday schedules shown here, however the logic and principals are the same. 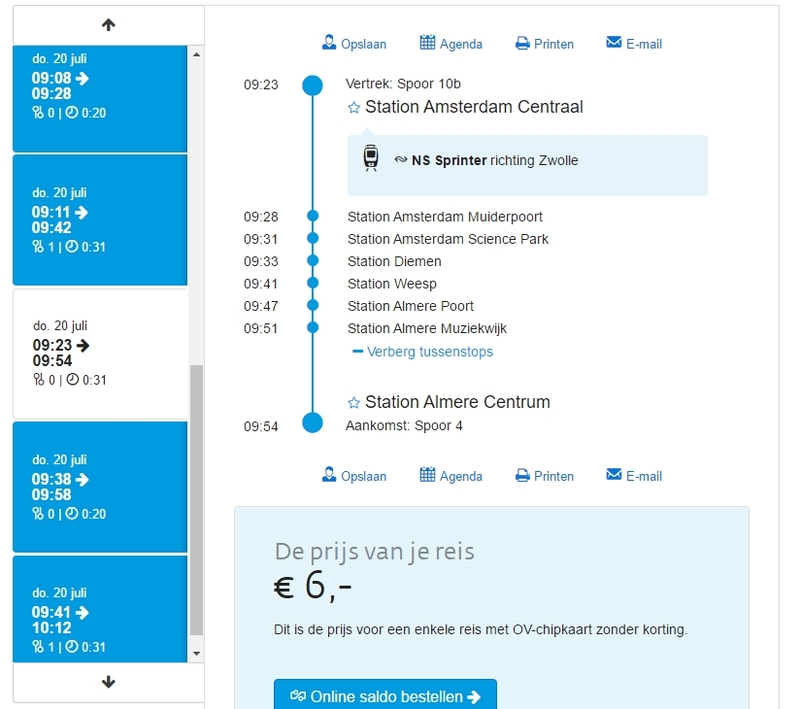 If trains are late, they updated departure and arrival times are shown while the original times are crossed out as seen in the pictures above. Track maintenance sometimes restricts travel to buses over short distances to get past the rail work. 9292.nl schedules will reflect maintenance issues.